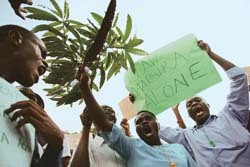 on april 12, three people were killed and eight injured in Uganda over protests against the government's plan to give away part of the country's biggest rainforest land (Mabira forest) to Sugar Corporation of Uganda Ltd (scoul). Among the people killed was an Indian. The protests took a racial dimension because part of the sugar firm is owned by Indians--the Mehta Group. The racial angle was played up, especially in view of the history of persecution of Indians, beginning during the Idi Amin regime. But this tended to obscure the deep-rooted problem that had to do with the grant of gazetted reserve forestland for commercial use. Still reservedscoul is a joint venture between the Mehta Group and the Ugandan government, which has a 30 per cent stake in it.Following requests from scoul to expand plantations, the government agreed to lease out one-third of the Mabira forest and initiated the process secretly. The issue came to the limelight in November 2005, after a Ugandan newspaper exposed it. In March 2007, the environment minister was ordered to make a cabinet paper asking for permission to de-gazette the reserve--a step necessary before transferring reserve forest land for commercial purposes. This triggered protests across the country. The cabinet, however, tabled the paper on April 18. But no decision has been taken yet. The Uganda government has now set up a ministerial committee to look into the matter and give its recommendations. Ecologists have repeatedly warned that the de-gazettement of Mabira will cause immeasurable ecological disaster in Uganda. Spread over an area of 30,000 hectares, much of the reserve forest is classified as strict forest reserve area. It is the biggest watershed in the area and feeds Lake Victoria, besides being home to rare species of trees and birds. Also, Mabira is the only source ofsubsistence and livelihood to more than 2 million people living in and around it. A report by Uganda's National Forest Authority (nfa) pegs its worth at US hs 911 billion (us $529 million)--2.2 per cent of the country's gdp. The company is, however, paying UShs 8.5 billion (us $5 million) for the land. "In Uganda, the issue is actually of poor environmental governance," says Gerald Tenywa, a local journalist. "Here, a political decision on environment is being taken by ignoring opinions of environmental groups, ngos and people," he says. nfa, an autonomous body that oversees the national forest reserves of the country, has also advised against the move. According to Uganda's constitution, forest reserves are "held in trust by the government for the people of Uganda", which means the process involves a series of consents from the community, the district council, the cabinet and parliament. "It is unfortunate that the president istrying to bypass the legislature and the judiciary," says Betty Obbo from National Association of Professional Environmentalists in Uganda. Racial overtone "Protests are widespread. ngos were merely spearheading it," says Harriet Kezaabu, senior researcher of Greenwatch, another ngo. Though the issue was initially stoked by vested interests, particularly leaders in the opposition, environmentalists and the public have now joined their hands. Save Mabira Crusade (smc), an umbrella organisation, is now leading the movement.Criticising the racial outburst, smc says "Instead of addressing reasons of the demonstration, the government is busy projecting the violence as a racial issue." According to Obbo, district councillors and parliamentarians oppose de-gazettment of Mabira. "The king of the local Buganda community has offered an alternative land in a bid to save the forest," adds Obbo. "If Mabira is de-gazetted, it will set precedence for other investment groups to eye upon other forests and national parks," says Achilles Byaruhanga of NatureUganda, an ngo. But for the Ugandan government, it's a tough choice between ecology and economy. As president Museveni had said in his letter to parliamentarians in December 2006 "...it is more difficult for a backward country to guard against environmental degradation than for a camel to go through the eye of a needle."